I was diagnosed with asthma 22 years ago; that means I have had a very long time to deal with breathing problems. When I crashed on my bike in 2009 and sustained numerous rib injuries, my breathing issues became worse because asthma is characterized by difficulty exhaling, while rib injuries affect the ability to inhale. I was a complete breathing catastrophe. I couldn’t effectively breathe in or out. I was only able to take short, shallow breaths from my chest, under-utilizing my diaphragm, the major muscle used for breathing leading to a constant feeling of discomfort. Since my surgery in August, I have been able to “relearn” how to breathe properly. It sounds crazy; learning how to do something that is primarily involuntary, but my rib cage, diaphragm, rectus abdominus and transverse abdominus had to be retrained. These muscles, like other muscles in the body, can get stronger. Eventually I was able to breathe from my belly rather than my chest. What a revelation! Now, I no longer feel like a pack a day smoker while running uphill and I am running times during workouts that I have not achieved since before my accident. Due to my own breathing problems, I have become attuned to the way people are breathing and I have seen that it is almost the norm for people to chest breathe rather than breathe from their belly. This is a distinct disadvantage for athletes. I know we have all experienced shallow breathing, whether in a race or at the end of a hard workout. Learning how to control your breathing will enable you to go faster and harder. We put together this series of exercises to help you learn to breathe properly. Practice it. It will pay off. First, here is a very cool video showing the action of the diaphragm and the rib cage. And, here are our exercises. Thanks to Roman Mica of EverymanTri for filming, Brandon Del Campo for being a great sport, and Robin Galaskewicz for helping us put together the exercises. Experience plays a huge role when it comes to racing. 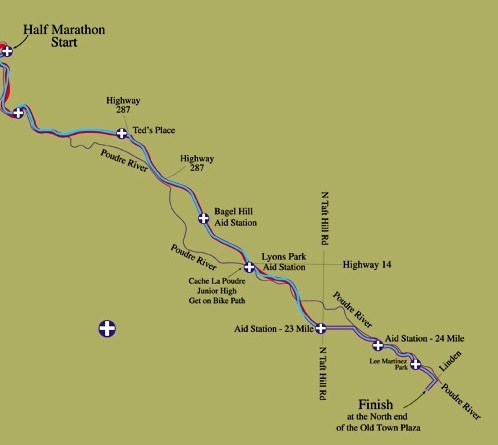 Take yesterday’s race, the Colorado Half Marathon, for example. Just before Mark dropped off my friend Jimmy and me at the bus that would transport us to the start, I asked Jimmy if he had any toilet paper; you know, just in case. He did not. I supplied him with some tissues and grabbed some for myself. As the bus jostled along to the starting area, I was anxiously anticipating using the facilities. When we finally pulled into the designated area, there was a bank of Porta Potties with hundreds of people lingering around them. For some reason, though, all of the bathrooms were open. The reason, you ask? They forgot to stock them with toilet paper! Jimmy and I did the happy dance and moseyed into the empty bathrooms. If 20 years of racing has taught me anything, it is always bring toilet paper on a run. Just as we emerged from our respective loos, dozens of rolls of toilet paper were delivered and the unhappy lingerers bee lined to the bathrooms. The Colorado half marathon is a beautiful course that starts a few miles up Poudre Canyon and runs down to Old Town Ft. Collins. With a 6:30 am start time, and a 5 am bus loading time, we decided to spend the night in Ft. Collins with our friend Jimmy. Jimmy and I go WAY back. 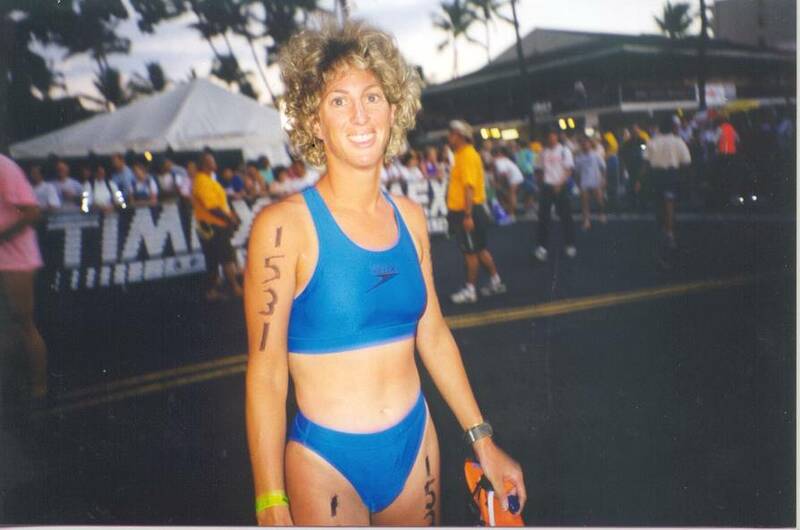 I’m talking all the way back to my first Hawaii Ironman in 1996. He even had pictures to remind me of the good ‘ole days. It was quite nostalgic to see the fashions, hair dos and younger faces of our close knit group who attended that year. Laugh all you want! This is me the morning of IM Hawaii in 1996. But, I digress. I thoroughly enjoyed the race itself. After the LA marathon, some rib issues flared up and needed some aggressive treatment. I looked to this race as a barometer of my progress in the continued healing of my ribs and also hoped to score a fast time on the mostly downhill course. This race was a success on both fronts. I had zero rib pain and I ran only 3 seconds slower than my PR which I set at sea level in October. My ultimate goal was to dip under 1:18, which I missed by 25 seconds, but I am still pleased with how the day turned out. I ran a consistent race, and because everything felt good and the scenery was stunning, the miles ticked by quickly. I was thrilled to win and was only beat by two men. Half marathons are interestingly uncomfortable races. I know for myself, I run almost at 10k pace for over double the distance. I realize this means I should probably run a faster 10k, but somehow I just don’t have any extra speed for the shorter distance. Unlike a marathon, where muscle fatigue often derails the pace, a half marathon requires concentration and the ability to push through the mental fatigue and respiratory discomfort. By this I mean, unless you really go rogue and start a half marathon way beyond your means, generally your muscles will not give out (unless you are untrained, which is another post entirely). It is the running at such a hard pace for so long that becomes mentally taxing and the worry of blowing up is ever-present. In addition, breathing becomes rapid or shallow from breathing so hard for so long. Half marathons are unique – they are just long enough to hurt but not long enough to hurt too much. Mental training for a half is just as important as the physical training. A major key to half marathon success: teaching yourself not to succumb to the voice in your head that yells “SLOW DOWN” when the pace starts to feel hard.